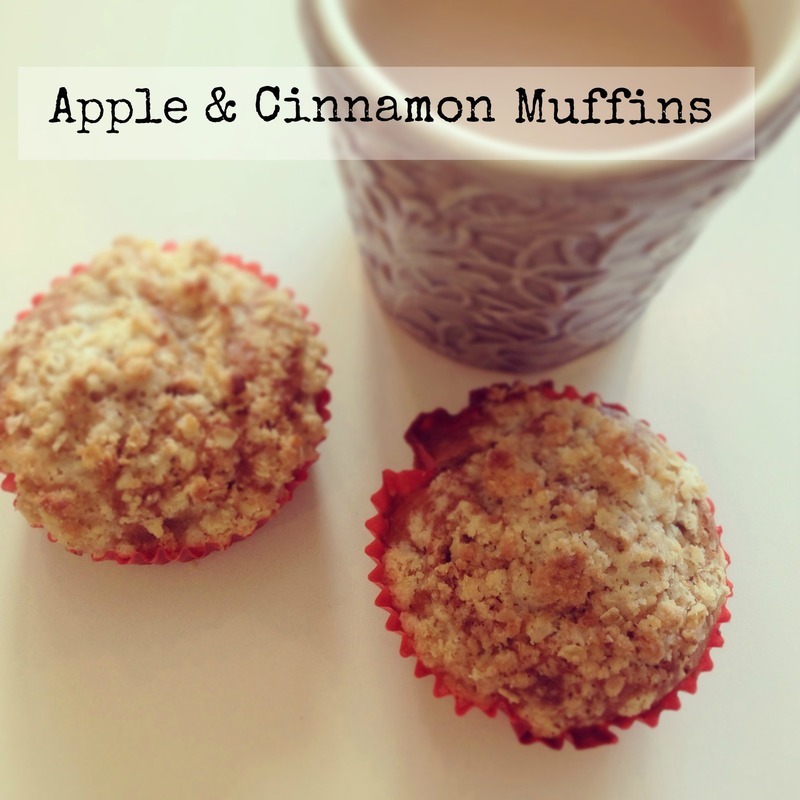 Apple and cinnamon is one of my all time favourite combinations and the two flavours come together beautifully in these muffins. The crumble topping can be omitted but it adds a bit of extra bite and texture and reminds me of the apple & cinnamon muffins that Starbucks used to sell. These are perfect for putting in lunch boxes for a sweet treat – yes, they contain sugar but they beat shop bought biscuits and cereal bars hands down in my book. Preheat the oven to 200 degrees. In a bowl whisk together eggs, sugar and vanilla essence until light and fluffy. Melt the butter and add to the egg mixture along with the milk and lemon zest. Mix together the flour, baking powder and salt in a separate bowl before adding to the batter. Cut the apples into small slices and fry them in butter, sugar and cinnamon. Let them cool down slightly. Add the apples to the batter and and fill up paper cases placed in a muffin tray until 2/3 full. Cut the cold butter into small pieces and pinch together with the oats, flour and sugar in a bowl. Scatter some crumble on top of each muffin. Bake in the oven for 12-15 minutes. NB: I had a lot of crumble topping left over so next time I will either halve the quantities or have some more fruit the ready to make an apple crumble at the same time. 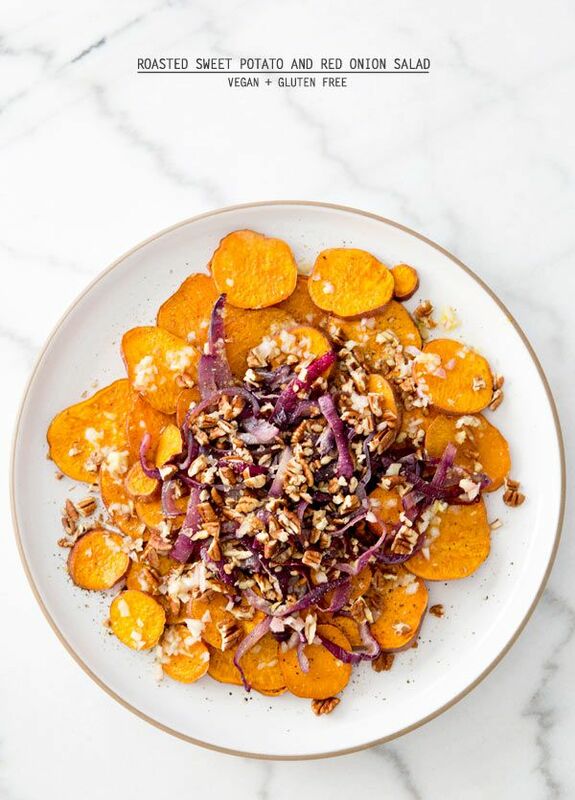 When life gets busy it’s easy to let healthy eating habits slip and instead reach for sugary snacks as a quick pick-me-up. 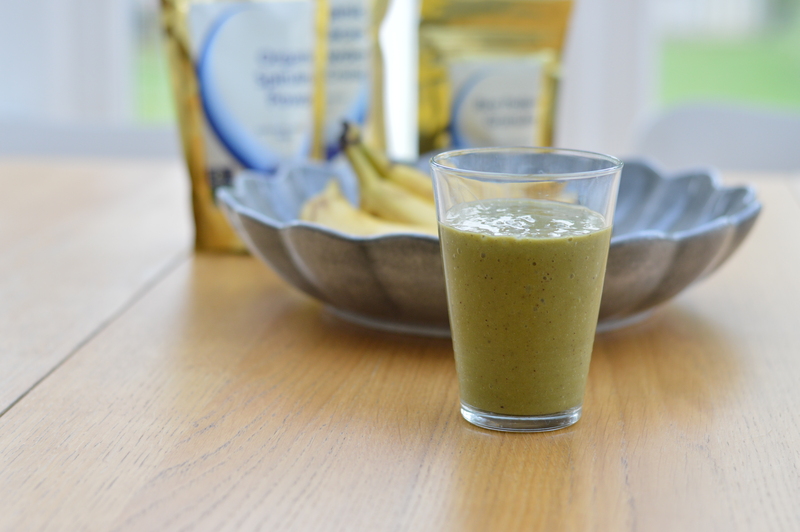 Having a smoothie for breakfast helps ensure that you get at least two or three of your five a day and, if you add some superfoods, it will also keep your energy levels high, boost your immune system and stave off sugar cravings. The lovely people at Indigo Herbs sent me a big box crammed full of some of their best-selling healthy goodies such as wheatgrass, spirulina, bee pollen and Acai powder. 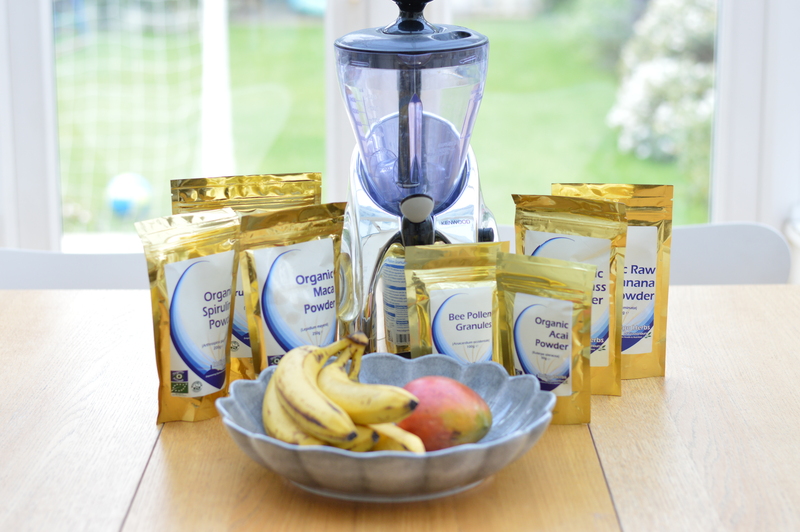 Time to dust off the smoothie maker and get creative! First up was this smoothie made from mango, bananas, orange juice and a teaspoon or two of organic Acai powder, organic wheatgrass powder, organic Maca powder, and organic raw banana powder. To find out more about the health benefits of these superfoods, check out the Indigo Herbs website. 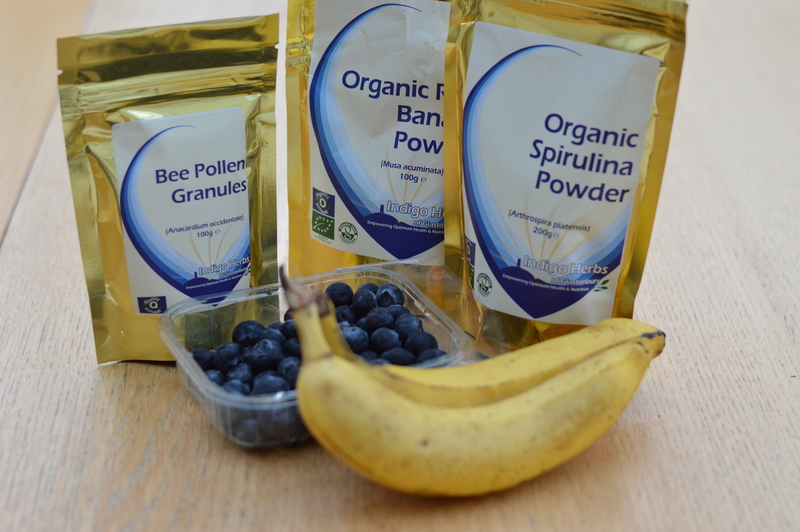 Next, I tried a blueberry and banana smoothie with some added spirulina powder, banana powder and bee pollen granules. 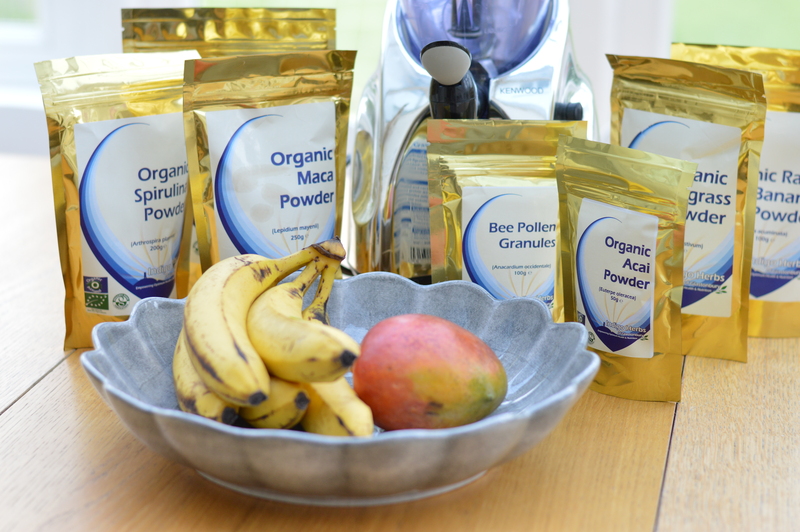 I was especially intrigued to try the latter as I had just read an interview with Victoria Beckham in Vogue where she was enthusing about bee pollen’s wrinkle busting properties and other health benefits. It has quite a coarse texture and I found that even after a thorough whizzing in the blender, there were quite a few large bits floating around in the smoothie. It still had a great flavour, although I preferred the first combination of ingredients. 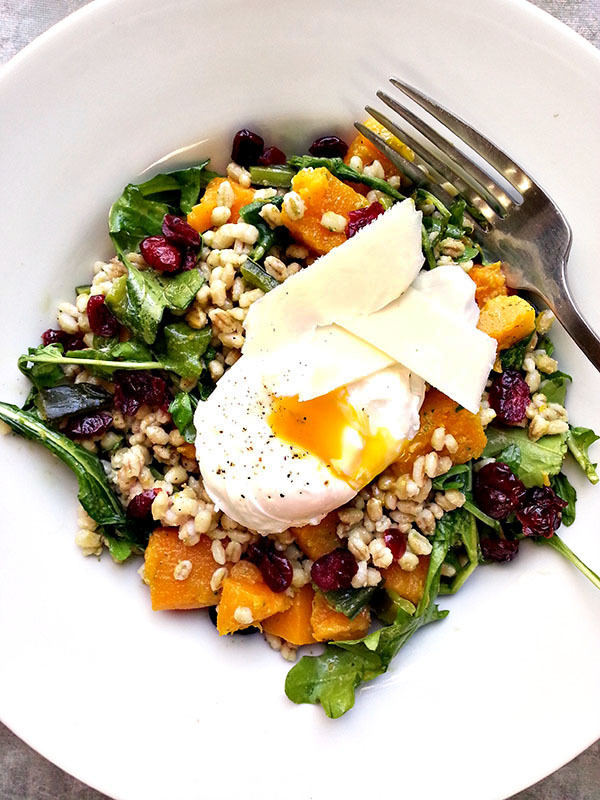 I also tried sprinkling some bee pollen granules on my morning muesli and that, to me, was a better way of eating it. A small, family run company based in Glastonbury, Indigo Herbs prides itself on only supplying the best organic, wild crafted or quality assured products available. All the powders came in generously sized packaging, so there’s plenty left for me to try more recipes. 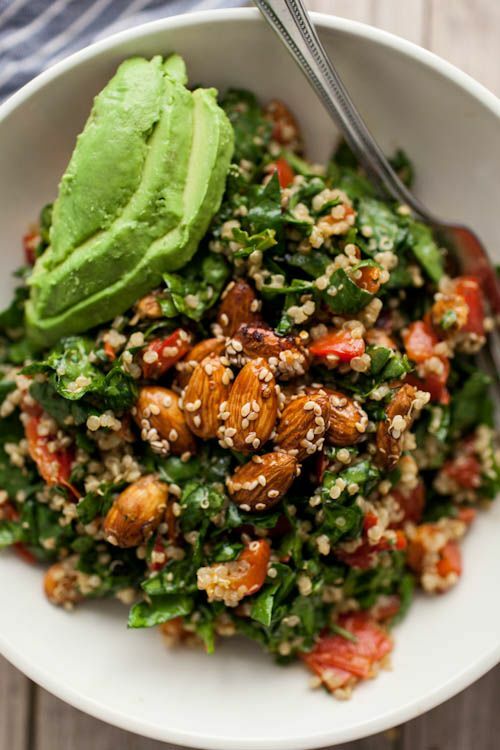 Ordering via the website couldn’t be easier and, although they will not give specific nutritional or medical advice, the knowledgeable team are happy to talk customers through the various products on offer. These biscuits are a real favourite of mine. 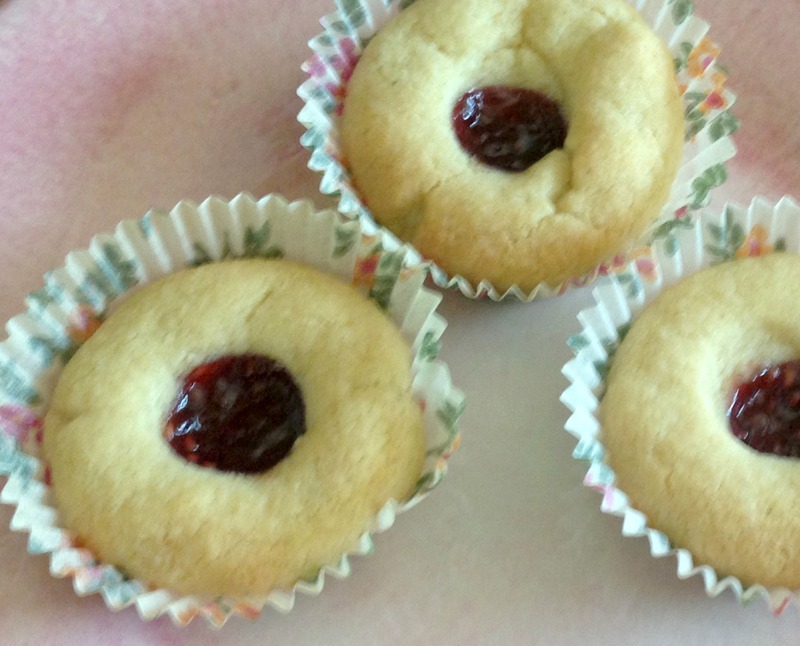 In Swedish they’re called Hallongrottor which translates to ‘raspberry caves’ and they remind me a bit of jammy dodgers although they’re much nicer than the shop bought ones. They also freeze really well so I like to whip up a big batch and keep for impromptu coffee mornings. 2. Stir together the butter, sugar and vanilla until smooth and light. Mix the flour with the baking powder in a separate bowl before working in to the dough. 3. Divide the dough into 20 pieces of equal size and roll into round balls. 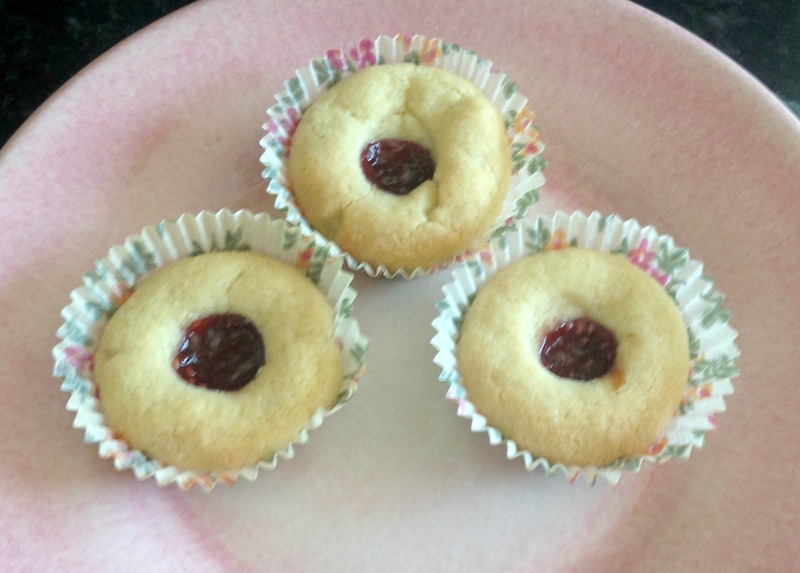 Place in muffin cases and, using your finger, make a small indentation in the middle. 4. 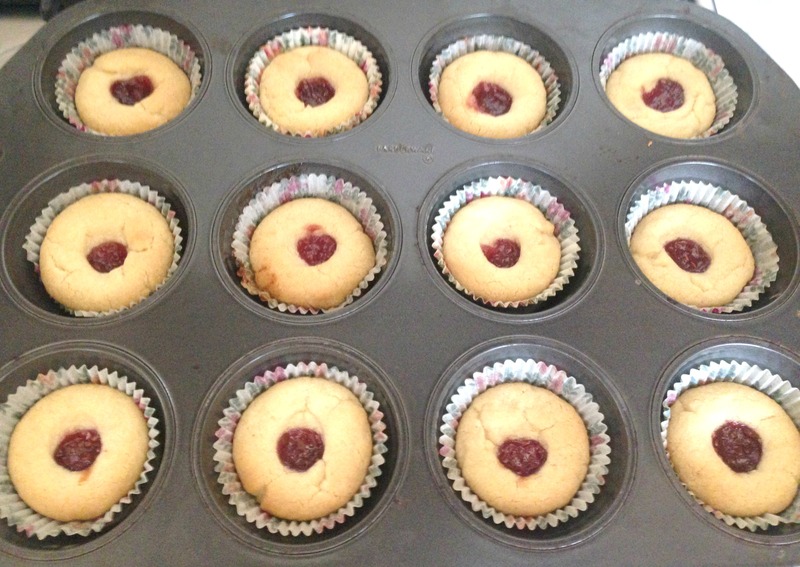 Fill the indentations with raspberry jam and bake in the oven for 12-14 minutes. 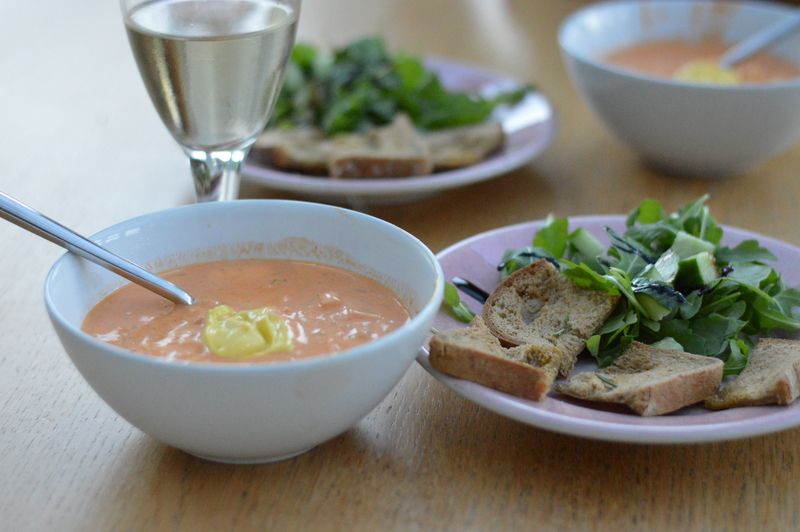 And you’re right, I probably wouldn’t choose to have this for lunch on a scorching hot day but eaten, as we did, at the end of a rainy summer’s day, it was simply delicious. 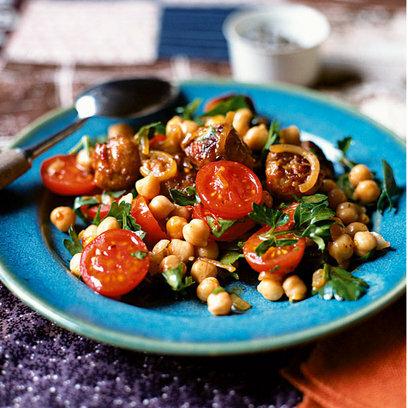 Just add some crisp salad, crusty bread (gluten free in our case) and a glass of chilled white wine and you have the perfect light supper. Finely chop the onion and garlic and fry in butter in a saucepan. Add the water and cream and bring to the boil. Add the fish and allow to simmer over a medium heat for around 5-10 minutes (depending on the size of the fish pieces). 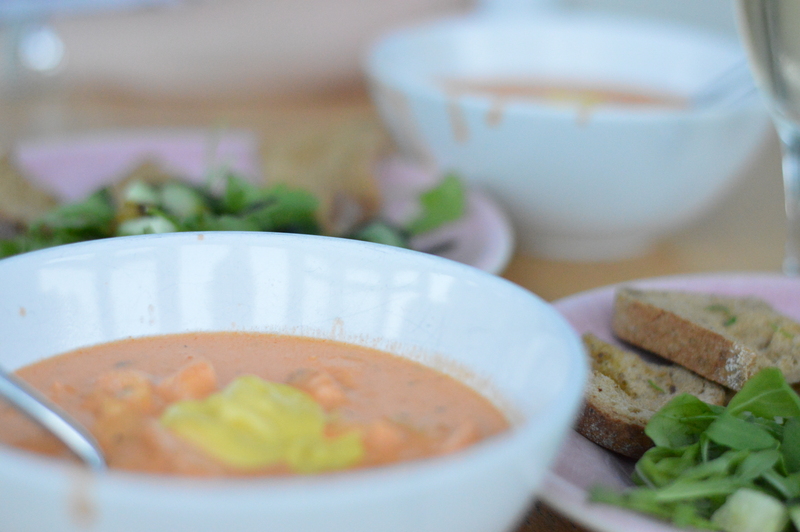 Pour over the tomato soup, season with salt and pepper and simmer for a while longer. Add the prawns and allow to heat through. Mix together egg yolk, vinegar, mustard and salt in a bowl. Whisk with an electric whisk and add the oil gradually. Continue to whisk until all the oil is added and the mixture has the texture of a thick mayonnaise. Add a small amount of water (approx 1/2-1 tbsp) and whisk some more so it becomes whiter and looser. Add the garlic using a garlic crusher and refrigerate the aioli for a while before serving. 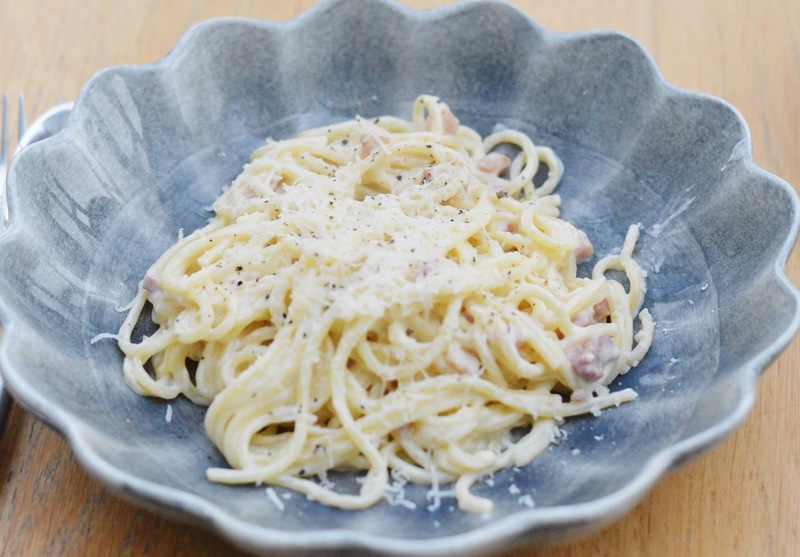 Spaghetti Carbonara is one of those classic dishes that everyone seems to have a slightly different recipe for, although the basics (eggs, pancetta, parmesan) remain the same. 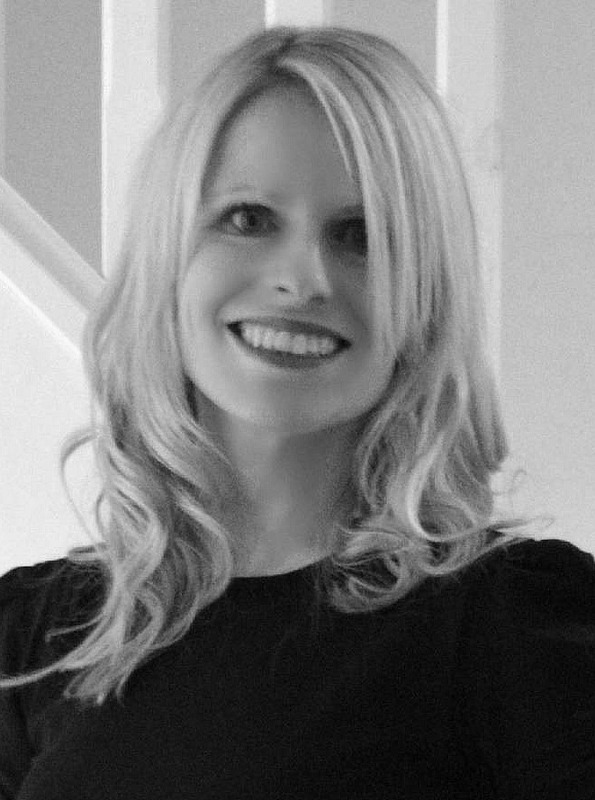 My husband makes ‘proper’ Carbonara without the cream, instead adding white wine and a sprinkling of nutmeg as per Nigella Lawson’s recipe. 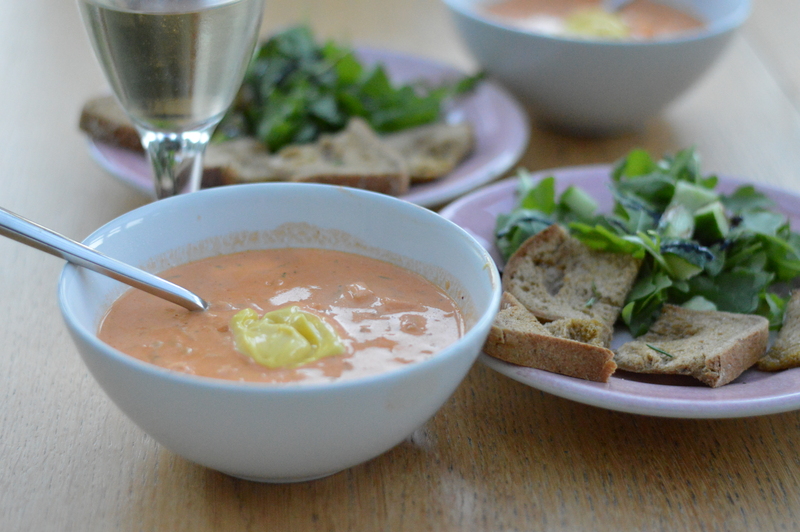 It’s very tasty but I’m pleased to say that the kids prefer my version! In fact, this is my eldest son’s favourite dish and he always requests it on special occasion or when he is having a friend over for tea. 1. Boil the pasta in a pan of water with a bit of olive oil according to the packet instructions. 2. 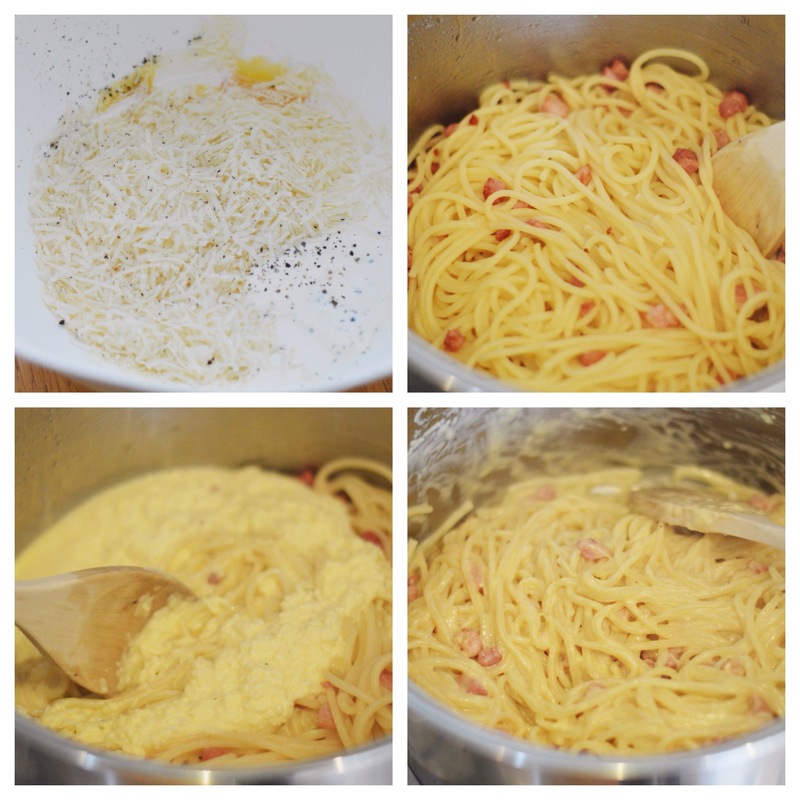 In a bowl combine the egg yolks, double cream, creme fraiche, parmesan and a good grinding of black pepper. 3. Fry the pancetta in the olive oil until it starts to crisp and remove from the heat until the pasta has cooked. 4. When the spaghetti is ready, drain and return it to the saucepan. Tip over the pancetta and butter. 5. Keeping the pan on a very low heat, pour over the egg mixture and stir it through until it thickens and coats all the strands of spaghetti. 6. 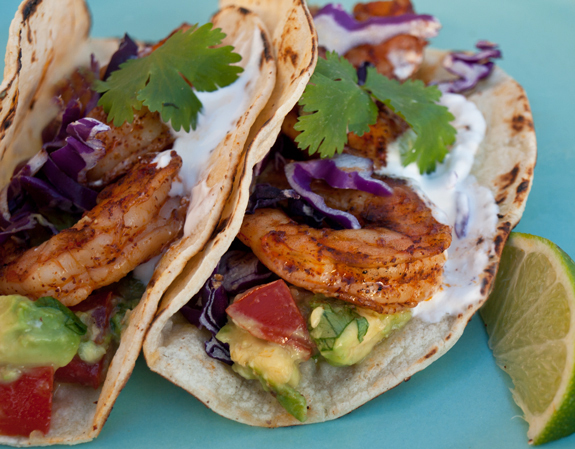 Serve immediately with extra parmesan and black pepper. 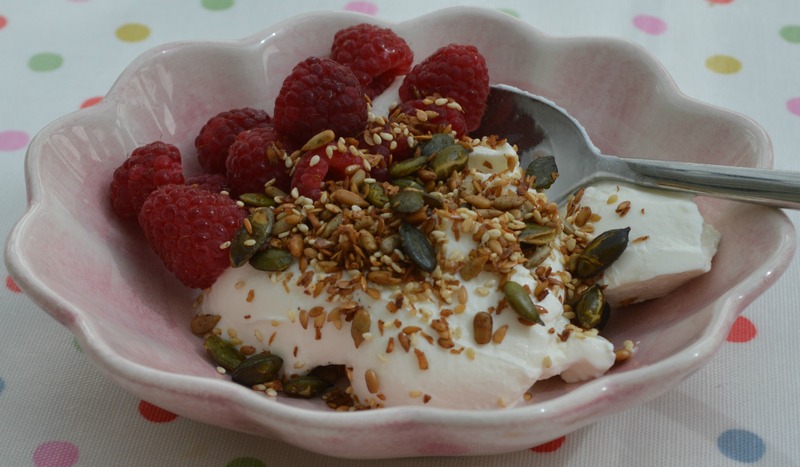 There is not much that beats a tasty bowl of granola with yoghurt and fresh fruit to set the day off to a good start in my book. The best granola I have ever eaten was a vanilla one created by the aptly named Hotel Vanilla in Gothenburg where we stayed for two nights a couple of years ago. 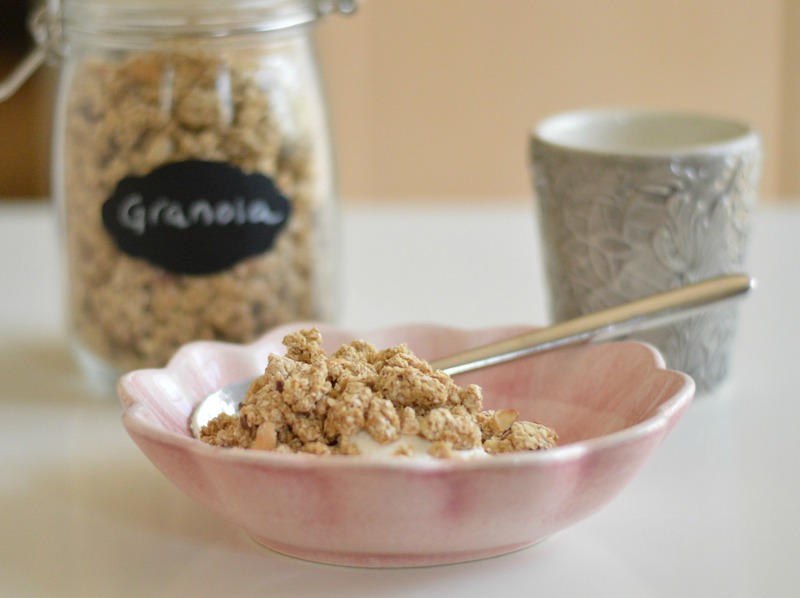 I brought a bag of their granola home with me, but it ran out many moons ago, so I was thrilled to find a recipe for a very similar sounding vanilla granola on a Swedish baking blog. I have made a couple of minor adjustments by adding cinnamon and almonds, and the result is, in my opinion, nothing short of divine. 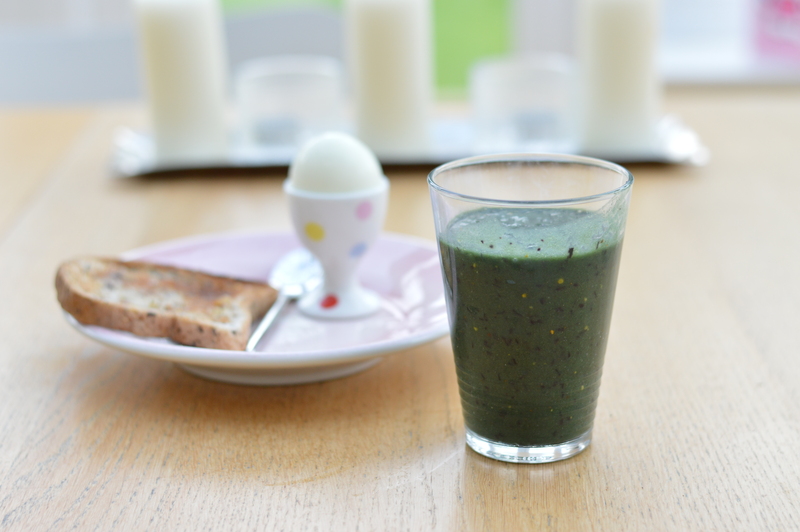 When breakfast tastes this good it is definitely the best meal of the day! In a bowl mix together the oats, nuts, cinnamon and salt flakes. Put the water and sugar in a saucepan and simmer gently until all the sugar has dissolved. Add the oil and vanilla, then pour the liquid over the oat mixture and stir it all together. Spread the granola out on a baking tray covered with parchment paper and bake in the middle of the oven at 100C for approx 2 hours. Stir the mixture occasionally, every 20-30 minutes. 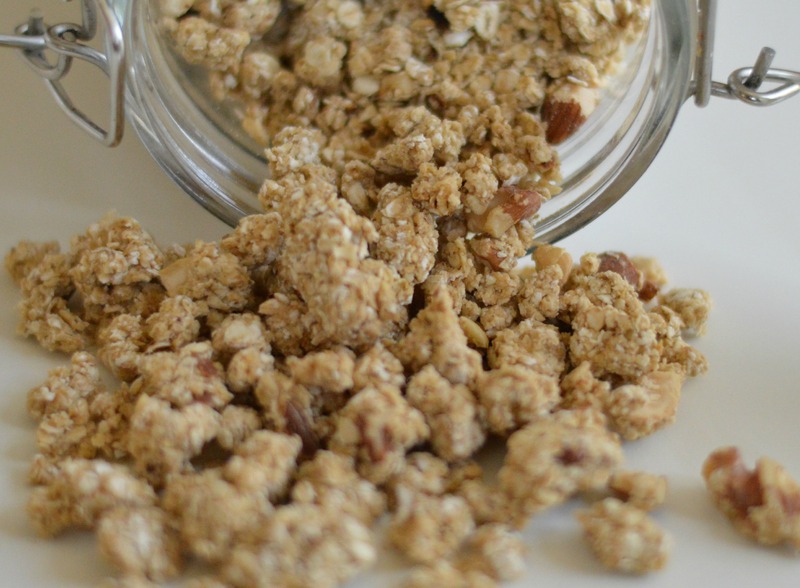 Let the granola cool completely before transferring to an airtight jar. With Easter’s chocolate egg overload just behind us, I’m sure the last thing on anyone’s mind is more sweet treats. But I couldn’t resist sharing the recipe for this apple pie which I made for pudding when my parents came over for lunch last week. Trust me, it’s definitely one to file away for a rainy day: along with cottage pie and grilled cheese, apple pie/crumble must be one of the ultimate comfort foods. 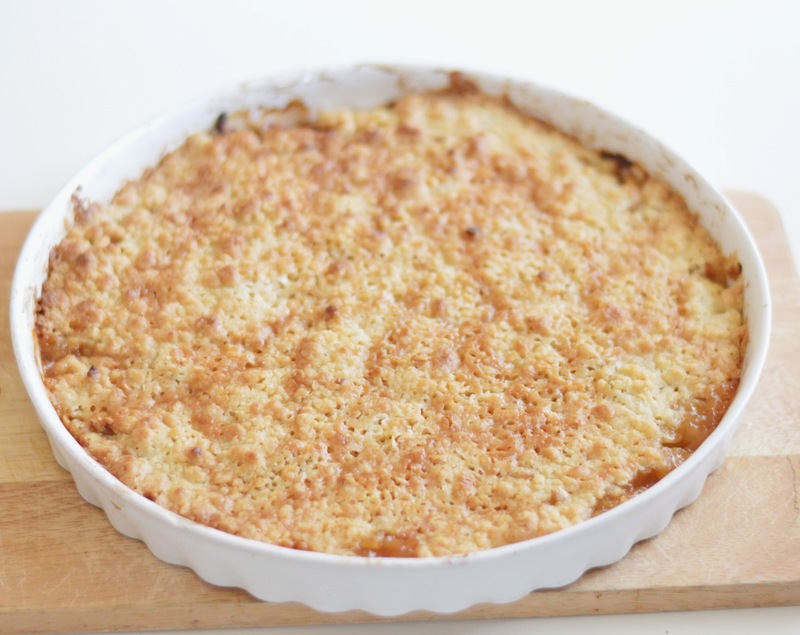 And don’t be alarmed by the salt flakes specified in the recipe – they provide a beautiful contrast to the sweet crumble topping and tart apple. And the secret to getting a really yummy caramelized topping? Drizzle some golden syrup over the pie before it goes in the oven. Pre-heat the oven to 225°C and grease a pie dish (approx 28cm in diameter). Crumble topping: cut the butter into pieces. Pinch together butter, flour and oats to form a crumbly mixture. Add the sugar and salt flakes. Peel, core and cut the apples into thin slices before mixing with the cinnamon, sugar and salt. 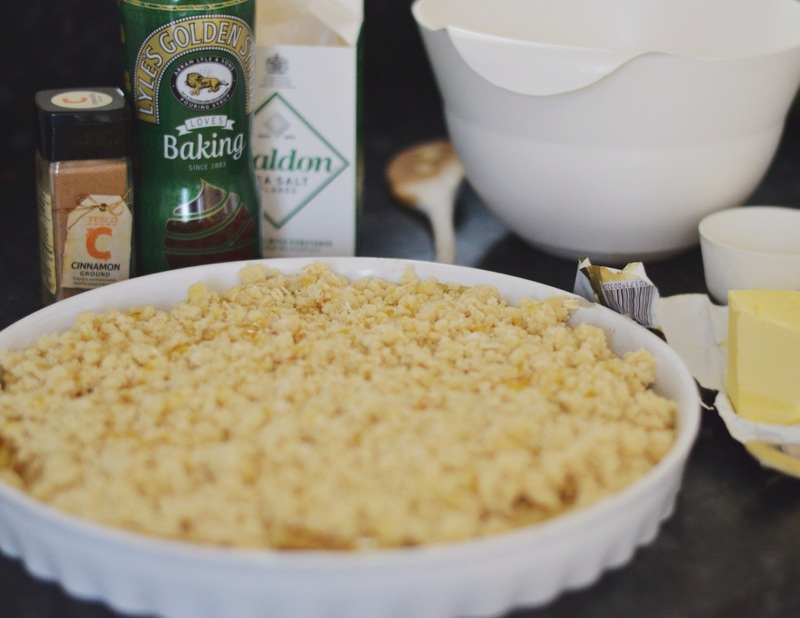 Put the apple slices in the bottom of the prepared pie dish and sprinkle the crumble mixture over the top. Drizzle some golden syrup over for a tasty toffee-like finish. Bake in the middle of the oven for 20-25 minutes. 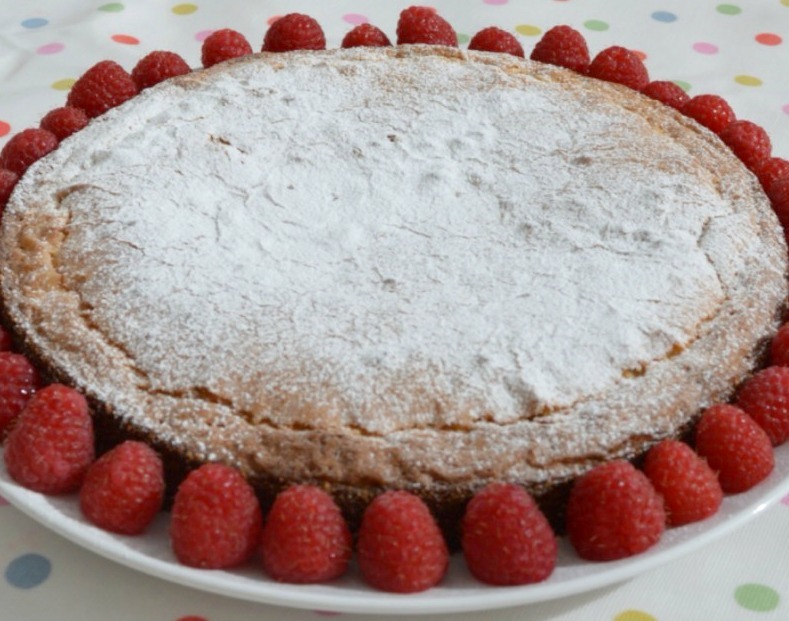 Let it cool slightly and serve with whipped cream, custard or ice cream. NB: As my husband can’t eat gluten, I made this crumble with gluten free flour and oats. It worked really well. As I’ve been working more than usual over the school holidays I haven’t had much time for baking, so it’s likely that my lot will have to make do with shop bought treats over the Easter weekend. 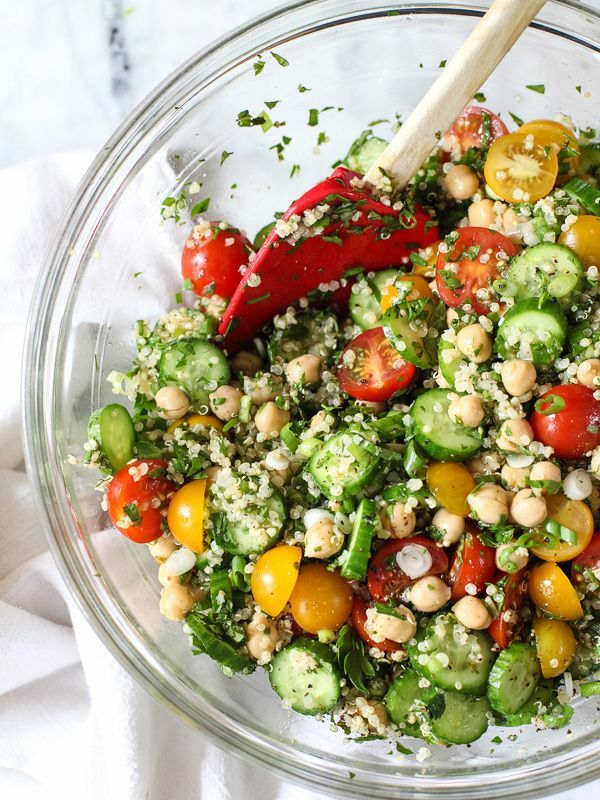 But if you have the time, here are some of the most tasty (and pretty) looking recipes that I have found on Pinterest. 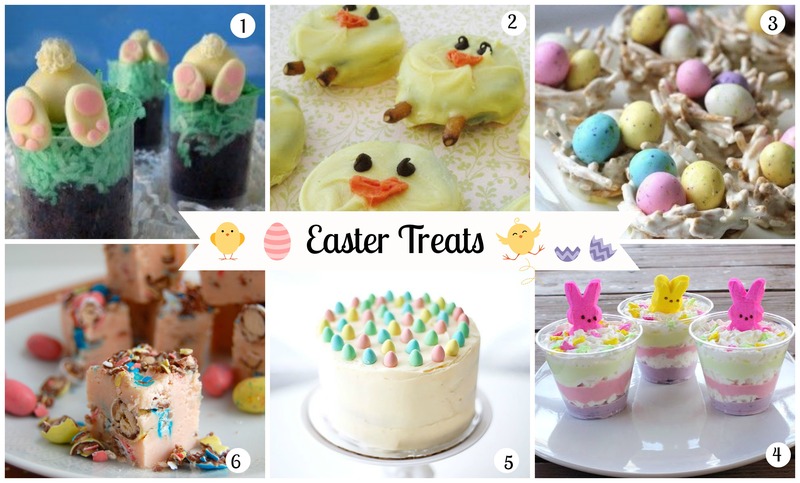 For more Easter recipes and ideas see my Easter Inspiration board on Pinterest.